What works to tackle poverty in the U.S.? How do we improve the prospects for every child in our country? Almost five years ago, the Low Income Investment Fund (LIIF) along with colleagues in the community development, private and public sectors sought answers to these difficult questions in the book, Investing in What Works for America’s Communities, published by the Federal Reserve Bank of San Francisco and LIIF. A person’s ZIP code is more important than her genetic code in determining her health and life outcomes. Fast forward to this spring, the conversations between the community development and health fields are becoming real world partnerships. We are working together to ensure that people feel safe in their communities and have access to nutritious foods, affordable housing and open spaces. The evolution from an idea to a larger movement has created a new way think about multi-sector collaborations and brought even more partners to the table. I’ll join Dr. Lavizzo-Mourey and many other thought leaders at an event in New York City on March 30th including, John C. Williams, President and CEO of the Federal Reserve Bank of San Francisco, Rip Rapson, President and CEO of the The Kresge Foundation, and Darren Walker, President and CEO of the Ford Foundation, to talk about the momentum behind this growing movement to invest in equity, prosperity and sustainability for all. I invite you to tune in to our live webcast from 9:30 AM – 1:00 PM Eastern tomorrow for this conversation, which will also introduce the Strong, Prosperous, And Resilient Communities Challenge (SPARCC). This $90 million initiative puts racial equity, health and climate at the center of improving the way we build the places we live, work and play. 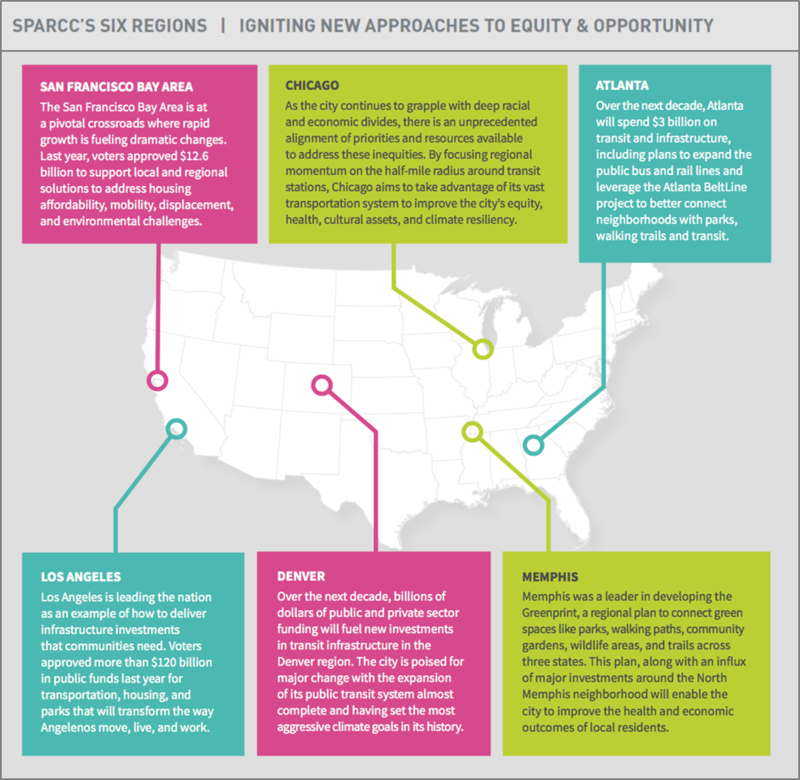 SPARCC invests in the ideas and action of locally led coalitions across the country that are rethinking the policies and practices that shape our built environment. SPARCC partners include Enterprise Community Partners, the Federal Reserve Bank of San Francisco, the Low Income Investment Fund, and the Natural Resources Defense Council, with funding support from the Ford Foundation, The JPB Foundation, The Kresge Foundation, the Robert Wood Johnson Foundation, and The California Endowment. These new approaches are also in line with the public’s view on how to tackle poverty. A new national poll sponsored by SPARCC, found that 74 percent of Americans agree more that lack of opportunities, not lack of hard work, keep people impoverished. And, approximately nine in ten say they support using public funds to invest in projects, from expanded access to health services and public transit to preparing for extreme weather events and updating housing policies, to help people lift themselves out of poverty. Read more about the poll and how we are advancing a new vision for promoting equitable growth in America in “How Local Leadership Can Drive Prosperity for All”. I look forward to engaging in a dynamic conversation with advocates, allies and my community development colleagues on ways to ensure every community is vibrant, healthy and self-sufficient.